Vacuum casting is a rapid prototyping technology that allows the duplication of dozens of plastic parts (with the presence of the undercuts) from a master model. The parts obtained are suitable for assembly testing. This process uses the vacuum effect to inject the material into a silicone mould (hence the alternative names “silicone moulding” and “vacuum casting”). The injected materials are polyurethanes whose Shore (hardness) can be adjusted. Therefore, unlike other technologies, it allows the creation of flexible parts. The silicone moulding requires a master model manufactured by 3D milling or printed by SLA. The mould then allows for perfect duplication. The silicone moulding first requires the manufacture of a master model by 3D machining or 3D printing. Once the master part is obtained, a silicone mould is created from it. The raw material is mixed and injected into this mould by suction in a vacuum bell jar. The cast part then hardens in an oven for 30 to 40 minutes before being removed from the mould. 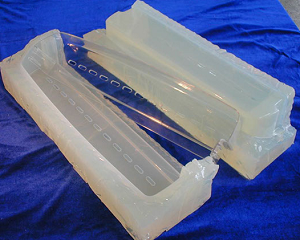 The silicone mould can be reused several times, which results in significant economies of scale from 10 parts, but it has a limited service life. This process allows the perfect duplication of the model part. 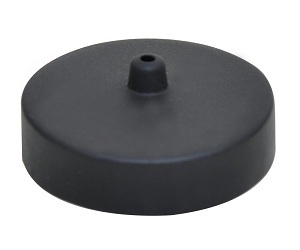 The parts obtained by vacuum casting are suitable for functional and visual testing. Indeed, the physical, mechanical, thermal and aesthetic qualities of the parts created are very similar to those of series injection parts. This is explained by the large number of available resins that offer a wide range of possibilities. We work in particular with the Axson and Heicast ranges. For example, the material can be transparent, can imitate a fibre reinforced, be of different hardnesses, or reproduce the properties of ABS, PMMA, PC, PE, PP, etc.. Finally, our workshop can apply various finishes, such as glossy finishing or soft touch and can simulate several applications such as overmoulding of inserts. The parts obtained by vacuum casting are visually and mechanically very similar to series injection parts. This technology is suitable for both rapid prototyping and low volume plastic parts production (fewer than 100 parts). The repeatability and speed of this process are indeed advantageous, because only 5 to 7 days are needed to produce 30 to 50 functional prototypes. For more than a dozen parts, vacuum casting is generally more relevant than 3D printing and CNC machining. Why choose vacuum casting ? Do not hesitate to contact us for more information on your project on silicone molding made in China! Hi, I would need about thirty prototypes with M3 insert on it; do you provide this application by silicone molding? We are capable of doing M3 inserts. 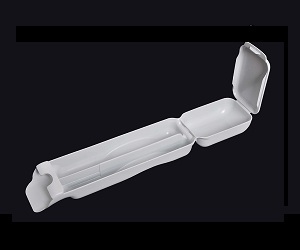 Depending on the part; we can do this via silicone molding with special post processing or CNC machining. Could you provide half-transparent/translucent parts by vacuum casting production? Hello, could you confirm which material do you use for vacuum casted pieces? I would require to test the resistance of the material before proceed to order. PX 100, PX 118, PX 5211 (PX 521HT), PX 5212, PX 5210, PX 527, UPX 8400, PX 212 (UP 5690), PX 223HT, PX 2017, PX 220 (UP 4280), UR 2180, XU50, 8260. Concerning elastomers (EPDM), we can make different shores (hardness) ranging from 50-90. We would be delighted to find the right material for your project. If you send us a 3D file we can do so right away.